I'm so over this winter and so is my dry skin. With a 90 percent chance of snow tomorrow, I thought this would be the appropriate time to share my new favorite dry skin routine. 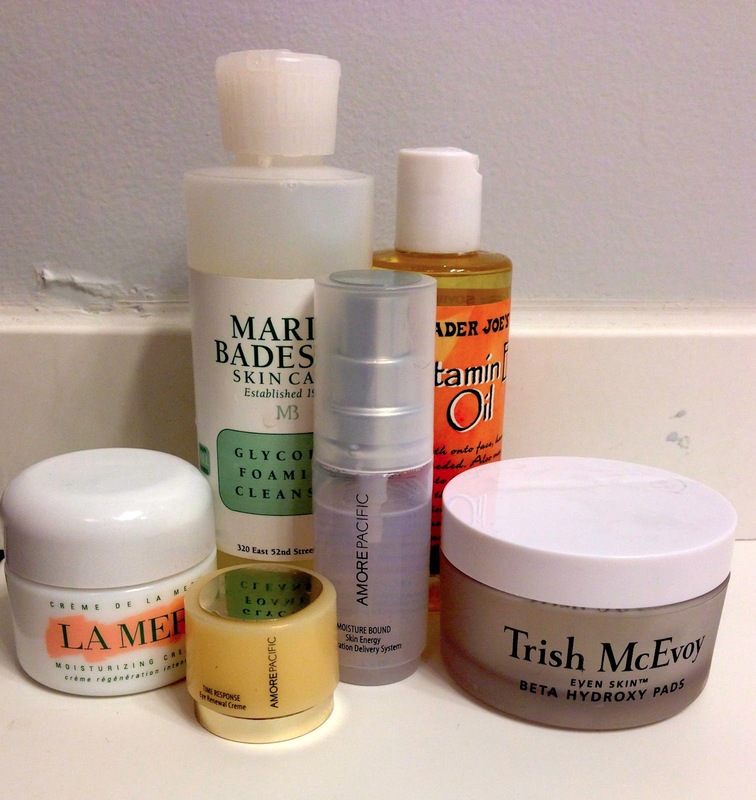 I pretty much have dry skin year round so I have tried my fair share of products over the years and settled into one for the last couple of years that I have found really works. I wash in the evening in the shower with Philosophy Purity face wash and my Clarisonic. 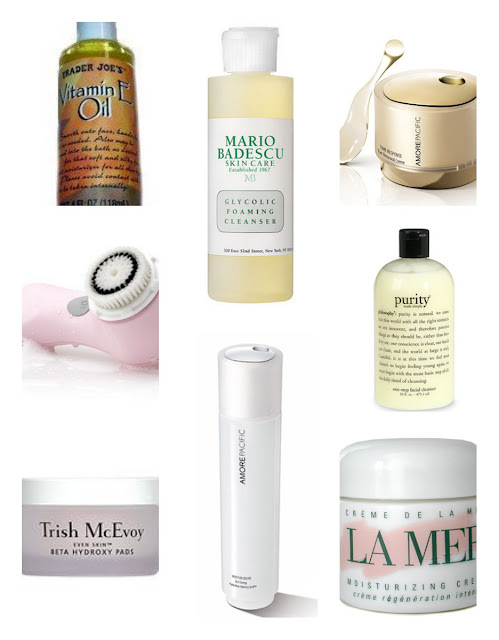 In the morning I use Mario Badescu Glycolic Foaming Cleanser. Two different ways to exfoliate gently. I have tried a ton of different serums but always come back to this super inexpensive and reliable standard: Trader Joe's Vitamin E oil. I used to slather my belly in this when I was pregnant and have no stretch marks (knock wood.) I put a dime size amount on my skin after I wash both morning and night. It is super softening and most anti-aging serums contain Vitamin E oil. I use a BB Cream or tinted moisturizer during the day (not shown) and at night put on a small amount of Creme de la Mer. I hate paying for it. It literally pains me, however, nothing else works as well as this on my skin. This is also coming from someone with skin so dry it flakes (ick!) If you know a less expensive alternative let me know! I am obsessed with Amore Pacific's Eye Renewal Cream. It feels amazing and my under eye concealer goes on so much more smoothly. I have been using this for years and have yet to buy a full size container of it. They give it away as samples at Neiman Marcus like crazy and I think I have managed to go three years on samples alone. I don't think they carry it in most NM's though - boo! I use Trish McEvoy Beta Hydroxy Pads on my face at night twice a week after washing my face. You just swipe them on and let dry then continue with your normal routine. These are a great exfoliator! On nights when I use these I end my lotion with a few sprays of Amore Pacific's Moisture Bound spray. It really helps seal in the moisture. I know this seems like a lot but getting samples of most of these products can go a long way and probably get you through a lot of the winter. Exfoliation and moisturizing make a world of difference! Do you have any dry skin tips or product recommendations? Share! My skin is beyond dry! I have been wanting to try the Le M. for years! Have not yet. I love Josie M. Argan oil. It is my "winter favorite." Great pos! I use her Argan Oil hair serum and love it! I definitely want to try the face kind too! I'm going to try the TJ's oil! That price can't be beat! Love these choices. My skin is so different now that I'm older and have had a baby. I will always swear by Cerave Lotion (in spring/summer) and their heavier cream (in fall/winter). My dermatologist recommended it to me years ago and no more flaking for me! Thank you for the suggestion! I have heard great things about Cerave! I will definitely give it a try!